Johnny Brazil in the 1960's! 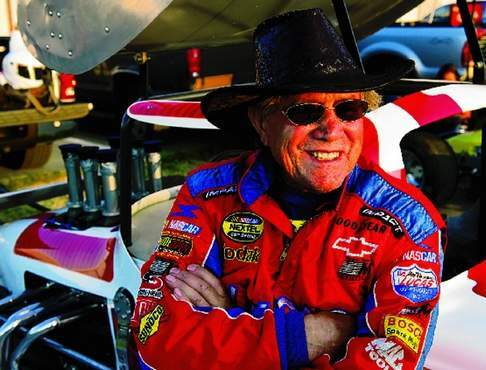 Johnny Brazil, the 77-year-old Mantecan who has the record for the fastest lap at Stockton 99 Speedway, won the Vintage Super Modified race and earned his 100th victory on Saturday during Johnny Brazil Night. STOCKTON - Johnny Brazil returned to Stockton 99 Speedway and celebrated his 100th. Victory, not birthday. Brazil, who is 77, looked as if he was still in his racing prime as he won the Super Modified Vintage main event and heat race on Saturday. It was his first race in 17 years, and track officials said records show Brazil won his 100th main event at Stockton 99, where he was the dominant star in the 1960s and '70s. "I had to wait a while to get it," Brazil said of the win. "It was fun to come out here and quite a night for me." It was Johnny Brazil Night at the track, and there was a display of pictures and newspaper stories honoring his accomplishments. In the week before the race, Brazil was offered a ride and decided to get back in a race car. The Super Modified Vintage cars are older modifieds. He easily won his heat race and then took the lead early in the 15-lap main event. He opened a large lead, but Everett Edlund of Caruthers closed in on him in the latter laps and made it close. "I had some problems with the steering, but it worked out OK," said Brazil, who said he'd think about going after win No. 101. The racing program was dedicated to Brazil, but the Wendt brothers of Lodi also had a memorable night. Mike Wendt won the first of two NASCAR Western Late Model main events, and Matt Wendt won the Super Stock feature. Jeff Belletto, center left, Dave Byrd, left, and Mike Wendt, far right, battle for the lead on a restart during the first 50-lap Western Late Model race Saturday at Stockton 99 Speedway. "It certainly was a good night for us," Mike Wendt said. "We built Matt's car ourselves, so that's very gratifying." Jeff Belletto of Modesto led most of the WLM opener, but retired with car problems on the 42nd lap. Mike Wendt passed Dave Byrd of Seaside on the restart and went on to win. It was Mike Wendt's third win of the season. Belletto came back and won the WLM finale. Matt Wendt won for the first time this season and held off a strong challenge from Sam Solari of Escalon. Other winners were Jeremy Tucker (Bombers), Jessica Walker (Legends) and Cindy Dueck (Powder Puff). There will not be racing at Stockton 99 on July 23 as the track will host a Charreada, a type of rodeo developed in Mexico. Racing resumes July 30 with a program of Western Late Models, Super Stocks and Bombers.